The Haftorah for Shabbat Rosh Chodesh is a special Haftorah read when Rosh Chodesh falls on Shabbat. Topic: The Tzaddikim (Righteous) Will Find Comfort in the Rebuilt City of Yerushalayim, While the Wicked Will Suffer. The Haftorah is read from the book of Yishayahu (Isaiah) 66:1-24, the final chapter in the book of Isaiah. The storyline of this week’s Haftorah: The first part of the Haftorah discusses how Hashem does not desire sacrifices from the wicked. Hashem says that He does not accept impure sacrifices in the house that is his resting place on Earth, The Bait Hamikdash (Holy Temple). The Haftorah continues with reassuring words for the loyal Israelites: The ones who bring pure sacrifices need not fear Hashem’s (G-d’s) wrath, for Hashem will bring a state of peace to Jerusalem. The prophet Isaiah predicts that Jerusalem will flourish with the ingathering of the Jewish exiles. He reminds the Jewish people that Hashem would not bring them this far to let them down. Isaiah explains that Hashem will punish the wicked; He will spill His anger on the evil people and destroy them. Isaiah also informs us that all the nations of the world will help bring back the remaining Jews to Jerusalem from many distant lands via several forms of transportation. Although much of the book of Isaiah could be seen as negative occurrences, Isaiah concludes his book with this thought: All the righteous people will find comfort in the rebuilt city of Jerusalem. • Was killed by Menashe, the King of Judah. Yishayahu was hiding from Menashe, the King of Judah, in a tree, but as Menashe was passing by the tree, he spotted Yishayahu’s tzitzit hanging out of the tree. Menashe then cut clean through the tree, killing Yishayahu. Yishayahu was killed cut through his mouth as a midah kineged midah, measure for measure, for speaking lashon ha’ra about the nation of Israel. Famous phrases: Isaiah: 58: 13, “Im tashihv me’Shabbat raglechah asot chahfatzechah beyom kadshi, V-karat la’Shabbat oneg likdosh hashem mechubad. Vchiybadito ma-asot derachecha mimtzoh cheftzecha v-daber davar. Az titanag al Adoshem vehirkavtechah al bamotai aretz v’ha’alticha nachalt Ya’akov aviycha ki pi Adoshem Yidaber. ” It speaks of Shabbat and its reward. “If you restrain your foot, because it is the Sabbath; refrain from accomplishing your own needs on my holy day. If you proclaim the Sabbath ‘a delight’ and the holy day of Hashem honored and you honor it by not engaging in your own affairs from seeking your own needs or discussing the forbidden – hence you will delight in Hashem, and I will provide you the heritage of your forefather Jacob, for the mouth of Hashem has spoken.” Said during the daytime Kiddush for the Sephardim on Shabbat. The Seal of the King Hezekiah – King of Judah who lived in the same time as the Prophet Isaiah. Haftorahman’s lesson of the week: In any successful marriage, two important guidelines to remember are; first and foremost; do not act in a way that will upset your spouse. Never do anything to push your spouse’s buttons. Second, do things that make your spouse feel special. Spend time with them, say nice things, give them gifts, and above all - be kind to them. In the time of Isaiah the Jewish people were sinning and upsetting Hashem. Hashem responded to them like an upset spouse. First Hashem removed Himself from the Holy Temple and then He sent the Jews out of Israel into exile. Hashem’s actions speak for themselves, “You had me and now you lost me.” Once the Jews lost their direct connection to Hashem, they recognized their sins, felt the loss, and wanted Hashem back. Hashem’s message to Bnei Yisroel is this: Make me feel special and don’t do things that will upset me, and then I will take you back. Starting this week, add doing something that will make Hashem feel even more special. Pick a positive commandment and increase your observance of it. Then pick a negative commandment, and reduce the amount of it you do. Hashem will be touched by your commitment to him. How nice would life be if Hashem increased his love for each and every one of us? 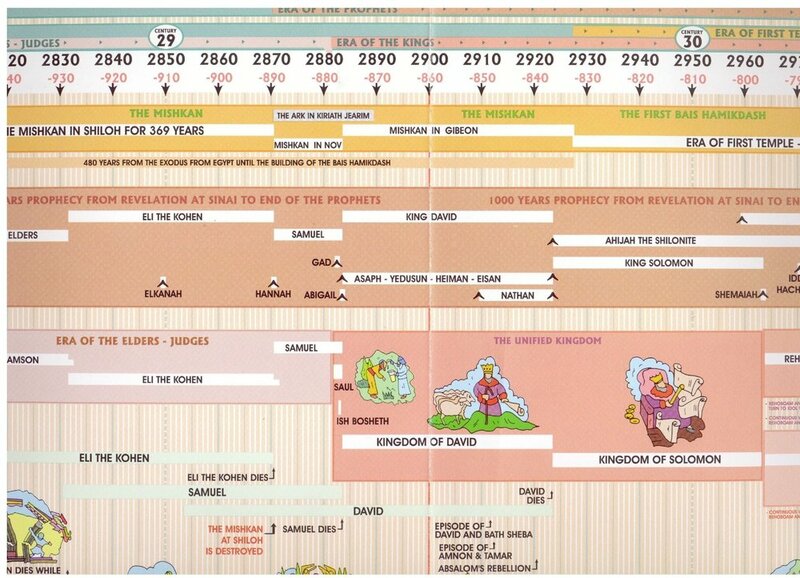 Timeline: Isaiah prophesized about 2600 years ago just before the destruction of the 1st Holy Temple. 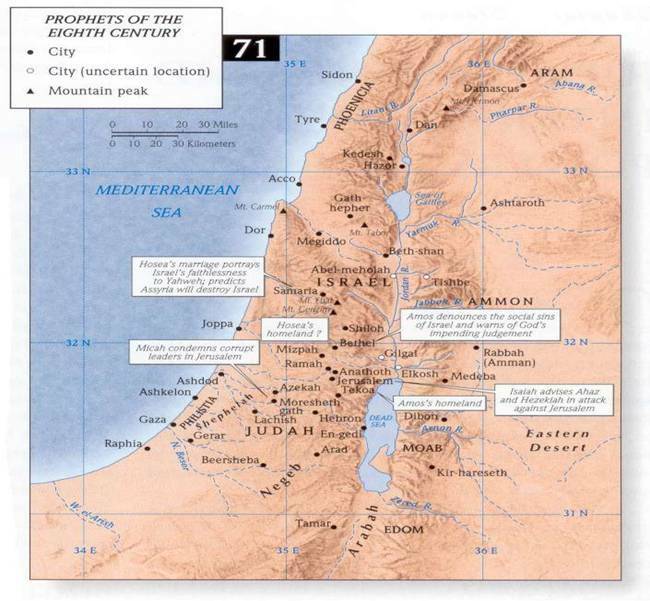 Map: Isaiah prophesized in the Holy city of Jerusalem.